As one of the world’s largest palm oil producers, Indonesia is often at the receiving end of criticism and protests by activists, and even by its own people. Its poor forest and land management practices, which have been going on for decades, have degraded both its landscapes and its reputation. Land conflicts between local communities and companies, between communities and governments, and even between the communities themselves, have become regular news in the media. Not only has this resulted in human casualties, but wildlife is stuck in the middle as their habitat is destroyed by oil palm plantation development. Killings of elephants and orangutans have been linked to oil palm plantations across the country. Nevertheless, despite land conflicts, Indonesia has long maintained a strong relationship with palm oil, beginning in 1911 when the first oil palm plantation with a total of 5,123 hectares opened in Aceh and Deli, North Sumatra. Success followed within a few years, with a total export of 576 tons of crude palm oil (CPO) to Europe in 1919, followed by 850 tons in 1923. An oil palm plantation next to natural forest in Borneo. Photo by Rhett A. Butler. Palm oil was a rising star commodity when it suddenly plunged during the Japanese occupation of the 1940s. In the span of a decade, its production level went from 250,000 tons in the early 1940s to 56,000 tons between 1948-49. Another reason for this was that then-President Sukarno had nationalized all Dutch companies, including oil palm, as state-owned companies as part of his campaign against foreign capitalism. Because their products were not intended for export, plantations were abandoned across the country. However, after Sukarno’s fall in the 1960s and the beginning of President Suharto’s New Order, the government began fully supporting oil palm plantation development by establishing the Plantation Limited Company. 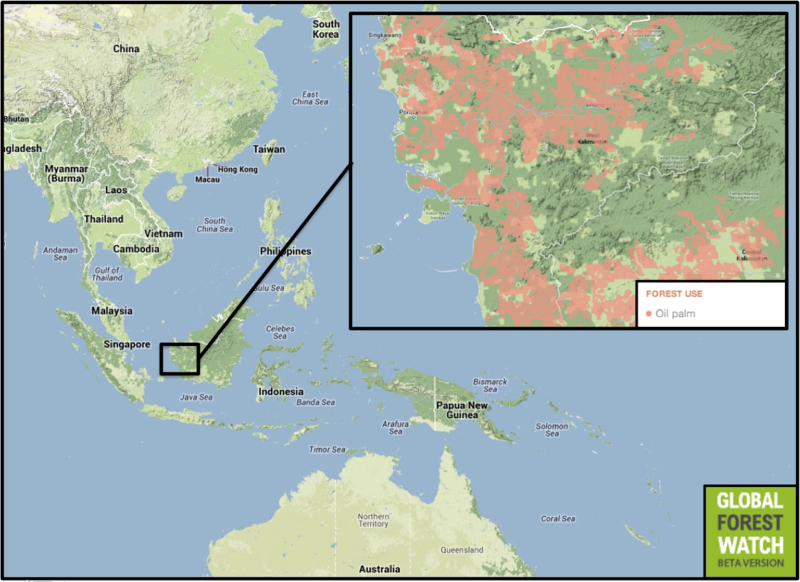 Oil palm plantations expanded dramatically during that time, from 65,000 hectares to 176,000 hectares in Sumatra alone. By 1985, 600,000 hectares of forest had been converted to oil palm plantations, representing a ten-fold increase over 20 years. Today the estimate of land under oil palm cultivation in Indonesia ranges from 8.1 million hectares, according to the Ministry of Agriculture, to 11.5 million hectares, according to Sawit Watch, an NGO palm oil watchdog. Further expansion is planned to meet Indonesia’s annual export target of 40 million tons of palm oil by 2020. With its existing plantations, Indonesia currently produces at least 23 million tons per year, which makes the country, together with Malaysia, responsible for nearly 90 percent of the world’s total palm oil production. However, the palm oil industry often contributes little to local communities, while igniting ever more conflicts over land. The Ministry of Agriculture maintains that 40 percent of oil palm plantations are owned by local farmers, but this claim is disputed by Sawit Watch, which argues that fewer than 30 percent of the plantations are managed locally. In 2012, the ministry stated that 59 percent of the country’s 1,000 palm oil companies were linked to land conflicts with local communities. These conflicts were identified in 22 provinces and 143 districts — Central Kalimantan with 250 cases, North Sumatra with 101 cases, East Kalimantan with 78 cases, West Kalimantan with 77 cases, and South Kalimantan with 34 cases. These land conflicts have become inexorably attached to Indonesia’s palm oil products, with tensions only expected to escalate in the near future. One-third of the total land area of West Kalimantan is controlled by palm oil companies. Courtesy of Global Forest Watch. Click to enlarge. The situation in West Kalimantan is one of hundreds of examples of Indonesia’s poor land management complicated by political interests. The rate of environmental destruction has become almost unstoppable. Palm oil is not the only offender; the province is also being bombarded by mining activities and industrial forestry concessions. Based on data from the Civil Society Coalition for Fair and Sustainable Spatial Planning, of the 14.4 million hectares of West Kalimantan’s total land area, 4.8 million hectares are owned by 326 oil palm companies, equaling the size of the entire province of Jambi. Meanwhile, 651 mining companies have secured permits for 1.5 million hectares, while 151 timber companies have acquired rights to 3.7 million hectares for logging. The coalition notes that nearly ten million hectares — or 70 percent of West Kalimantan’s total land area — are being controlled by 529 companies. That leaves 4.4 million hectares, or 30 percent of the total area, for the province’s 4.3 million people, 3.7 million hectares of which are designated as protected. As a result of squeezing larger numbers of people into smaller amounts of space, conflicts have increased significantly to an overall total of 104 reported cases. Seventy villagers and activists have been arrested for rejecting oil palm plantations on their lands. Even so, the local government remains committed to converting a further 1.5 million hectares for oil palm plantations. These overlapping forest management practices have caused serious environmental impacts, the costs of which are often borne by local communities. At the same time that they are losing access to water and traditional food sources, they are being accused by local authorities and companies of encroaching, land grabbing, or even blocking national development. Where once they were guardians of the land, these communities are now considered threats. These social conflicts are due fundamentally to the prioritization of business-oriented development over human welfare. Permits are more readily granted to larger companies than to local people. Unable to use forest resources to maintain their livelihoods, many local people are forced to work as cheap labor at plantations. In some situations, those who reject oil palm development are regarded as criminals by authorities. Orangutans are being killed in Kalimantan at a faster rate than is sustainable, due in large part to deforestation for oil palm plantation development. Photo by Rhett A. Butler. When implemented in 1999, regional autonomy in Indonesia was considered a vital part of democracy after decades of oppressive administration by the central government. However, its initial purpose to uphold the values of democracy has been sidetracked by individuals who have hijacked the idea to enrich themselves. By 2013, as many as 300 regional heads had been charged with corruption, ranging from bribery and abuse of power, to misusing regional budgets. Most of these corruption cases are connected to natural resource management. It is increasingly evident that campaigns for regional elections require substantial funding to secure seats. The easiest way to obtain funding is to supply permits and concessions to companies. 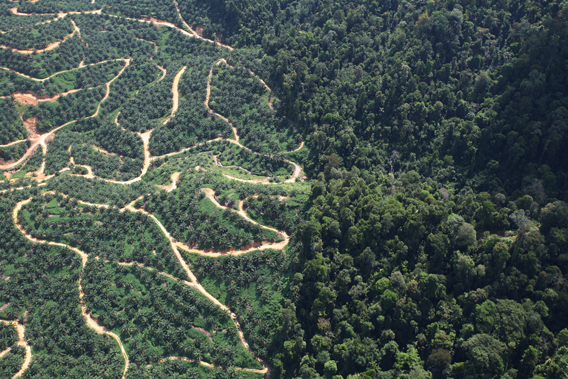 In this way, palm oil, mining, and timber industries have become ATMs for politicians. One example involves Ketapang district in West Kalimantan, where exploitative activities, like mining, logging, and palm oil conversion, have mushroomed in recent years. In its latest report, “Deplete Earth, Pursue Seat: Land Use Change Political-Business Patronage,” Indonesian Corruption Watch (ICW) revealed how the then-Ketapang Bupati (head of district) Morkes Effendy had been strongly suspected of misusing his position for personal and political purposes by giving out permits to oil palm plantations and mining concessions from 2000 to 2010. In 2012 ICW reported Morkes Efgendy to the Corruption Eradication Commission, popularly known as KPK, for granting permits for mining concessions in Durian Sebatang, Ketapang. 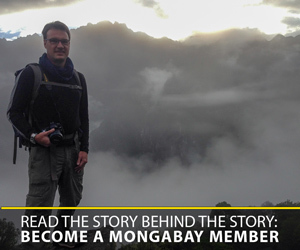 Meanwhile, the Mongabay-Indonesia team investigated Effendy’s involvement in granting permits to PT Kayong Agro Lestari (KAL), which was owned by his son, Yasir Ansyari. Effendy issued Plantation Permit No. 551.31/0562/Disbun.C to KAL on March 12, 2004, for 20,000 hectares in Matan Hilir Utara, Ketapang district, formerly a densely forested area. In 2006, KAL obtained a permit extension through Effendy, who assumed the Ketapang Bupati position for a second term (2005-2010), through Plantation Permit No. 551.31/0615/Disbun.C issued on March 20. News of the company elicited mixed reactions from villagers. Laman Satong villagers accepted KAL under the conditions that the company must employ local people. Meanwhile, Riam Berasap villagers rejected all oil palm plantation development, fighting to exclude concessions in their areas. In 2010, KAL was in the process of a high conservation values (HCV) assessment, which is required for the development of new oil palm plantations. However, Ansyari failed to secure his father’s position as the bupati of Ketapang, losing the election to Effendy’s former deputy, Henrikus. Loss of the the Bupati seat resulted in complications for KAL development. The new Bupati, Henrikus, then granted permits for mining concessions in the same areas as KAL oil palm plantations. The overlapping permits have resulted in additional tensions in Matan Hilir Utara, especially for Laman Satong villagers, who are divided into pro-mining and pro-oil palm camps. Complications for KAL arose as political affiliations changed within the new administration — Effendy and Ansyari are devout Golkar politicians while Henrikus was supported by the Democratic Party, along with the Indonesian Democratic Party of Struggle (PDI-P) and the National Mandate Party (PAN). The current administration has issued mining permits to PT Laman Mining in Matan Hilir Utara, the same location as KAL concessions. While the companies bicker over the spoils, these overlapping permits worsen the situation for local villagers, especially in Laman Satong. What is happening in Matan Hilir Utara is just one of many examples of rampant, politician-enabled industrial “development” in West Kalimantan. 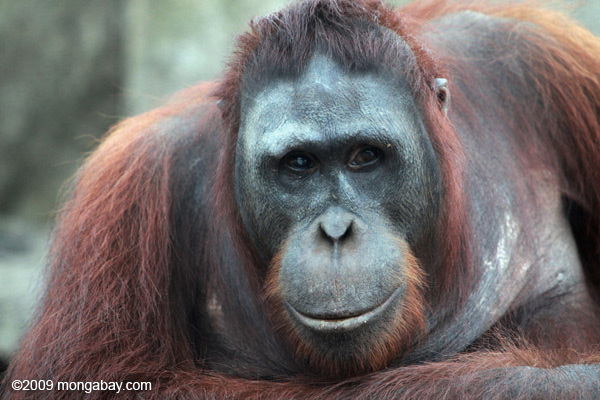 “These ‘affairs’ between local businessmen and government are not something new and local people are the ones who really suffered from pro-business policy,” Tito Indrawan, Director of Palung Foundation, a Ketapang based NGO focusing on orangutan conservation, told Mongabay-Indonesia. The sentiment is shared by Hermawansyah of Gemawan Institution, a West Kalimantan-based NGO that focuses on empowering local communities. (04/17/2014) The Malaysian state should play a more active role in supporting the transition toward less environmentally destructive palm oil production, says a coalition of Malaysian NGO’s. In a statement issued Sunday, the Malaysian Palm Oil NGO Coalition (MPONGOC) urged Malaysian banks, palm oil associations, and other government-backed institutions to commit to ‘improving social and environmental standards in the palm oil industry’. (04/10/2014) Forest clearing within areas zoned for timber, logging, oil palm, and mining accounted for nearly 45 percent of deforestation in Indonesia between 2000 and 2010, finds a new study that examined forest loss within industrial concessions. (04/10/2014) Expanding oil palm plantations are among the top reasons for deforestation globally, along with cattle ranching, timber, and soy. However, a small palm oil production outfit recently became the first cooperative in the world to achieve Rainforest Alliance certification for sustainable growth of African palms, employing a number of innovations to ensure the prosperity of both forests and local communities.